Bread Baker's Apprentice - Friends are joining me in the kitchen to help me bake up some of Peter Reinhart's recipes for the Bread Baker's Apprentice challenges. This weekend we're baking up Pain a l’Ancienne, Pain de Campagne, Pane Siciliano, Panettone, so we've got a lot ahead of us. Wine & Dine: South Africa - We're getting a taste of South Africa for the dinner I'm hosting tomorrow night. I've encouraged my friends to find and prepare a South African recipe to bring to this month's potluck. Aside from getting a taste of this unique cuisine, we'll be doing a blind wine tasting and learning more about South African wines. If you've ever been curious about the cuisine and wines of South Africa, be sure to come back in a few days and check out what we feasted on and learned from our wine tasting! Baking With Dorie - As much as I love sweets and baked goods, I enjoy sharing them with friends even more. To take that a step further, friends are coming over and we're going to tackle the Dorie Greenspan recipes chosen for the Tuesdays With Dorie baking group. Four sweet recipes await and I'm looking forward to see how they turn out! Peanut Butter with Caramel Apple: "Delicious, tart apples. Sweet, yummy caramel. Remember this delicious combo? Enjoy it every day now in our smooth PB on a bagel, English muffin, toast, sandwich -- or eat it right off the spoon!" Peanut Butter with Chocolate Chip Cookie Dough: "Remember loving chocolate-chip cookie dough more than the actual cookies? You'll be in dough heaven when you dig your spoon into this superbilicious fusion of childhood delights." Peanut Butter with Dark Chocolate Duo: "Made with European chocolate. Dark. Rich. Decadent. What this has to do with Europe we're not sure. But we do know this: Imported chocolate and premium peanut butter make your tongue do gymnastics." Peanut Butter with Jungle Banana: "Deep in the heart of the dark jungle stalk the tasty treats now held in a jar of Jungle Banana premium peanut butter. The untamed flavor of bananas are now caged with the fiercest peanuts. They practically pounce into your mouth. Grrr!" Peanut Butter with Sumatra Cinnamon & Raisin: "Here is some very special cinnamon in this peanut butter. It is called Korintje and it is from Sumatra. The raisins swimming with the cinnamon in the premium peanut butter are plump and scrumptious. You may want to sit down to eat this one." "You will think I am crazy but I have not eaten a peanut butter sandwich in my entire life. I like it on crackers, toast or English muffins." Congratulations to Kristin! 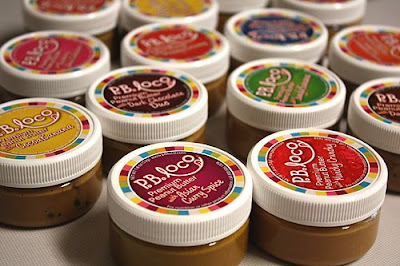 Please email me at [email protected] so I can have the three gourmet PB Loco peanut butters of your choice sent to you! Thanks again to all those that commented and stay tuned to the next Foodie Freebie announcement on Monday, September 28, 2009! Don't feel discouraged if you haven't won yet - I have a whole year's worth of freebies ahead and next week is one that you won't want to miss!